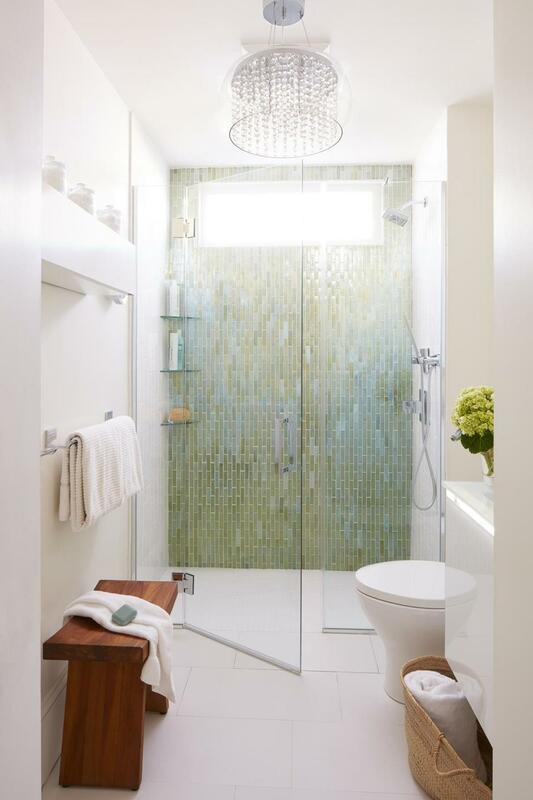 This bathroom was designed by Barbara Elza Hirsch of Elza B. Design Inc.
Barbara Elza Hirsch of Elza B. Design Inc. transformed homeowner Brenda Prescott’s gloomy 62-square-foot Cambridge bathroom into a still-diminutive yet glamorous jewel. A drum-shaped crystal chandelier from Euro Style Lightingsets the tone. The tall frameless, curbless glass shower door from Country Glass Co. creates a sense of grandeur and airiness by making the ceiling seem higher than it is. White subway tile from A&B Marble and Tile Design in Arlington with a crackle finish is positioned vertically to emphasize height. Large-format porcelain floor tiles from A&B in white with a touch of glimmer contribute to expanding the space. Siderna by Brizo fixtures have a spare, linear design, and the showerhead has water-saving technology. The front panels of the white-lacquer floating shelf from CB2 flip down to reveal additional storage. The modern floating vanity by Robern has a stylish (and functional come nighttime) strip of horizontal light and a chic glass countertop. A teak shower stool Prescott purchased at Bed, Bath & Beyond adds warmth and lends a spa-like vibe that’s reinforced by the French wicker market basket that Hirsch got in France. Similar ones can be found at www.french-baskets.com. Marni Elyse Katz blogs about design at StyleCarrot.com. Send comments to Address@globe.com.